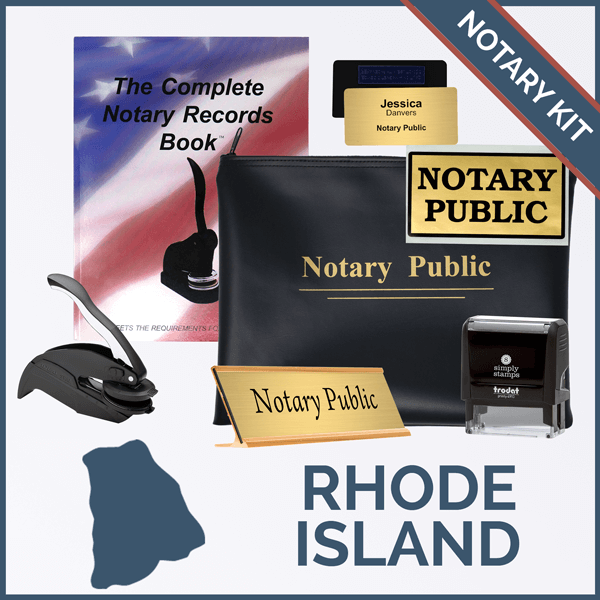 Our Rhode Island Deluxe Notary Kit contains the essential stamp and seal along with a decal, sign, name tag, record journal and pouch to keep you organized! Notary Public Sign with Frame | 2" x 8"
We provide the latest Rhode Island-recommended notary seal and stamp designs, and our Deluxe Kit is sure to contain everything you need to get started as an official Notary Public. Select your stamp model and embosser style that are sold along with an official decal, engraved notary sign, name tag, record journal and zippered pouch. This kit ensures you stay organized and ready for every notorial act. Need help? Read our helpful Rhode Island Notary FAQs.